If you love action hero movies, this story is going to blow your mind! Actually, nobody would be left unimpressed after reading it! 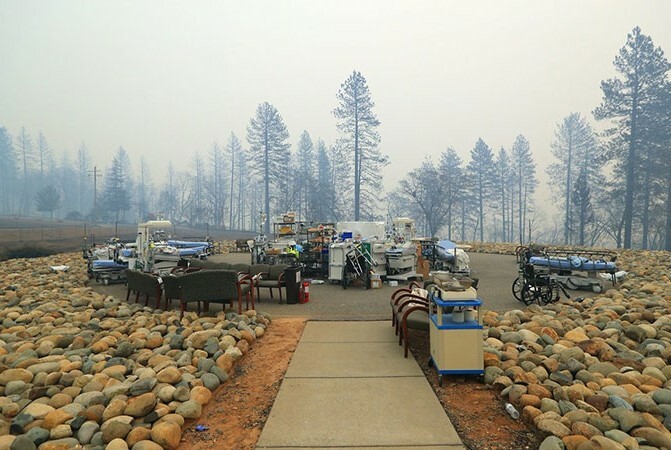 The worst wildfires California has ever seen took the lives of many people and caused unprecedented damage. However, the critical situation separated the boys from the men and some individuals quickly turned into real life heroes! Allyn Pierce is one of them! 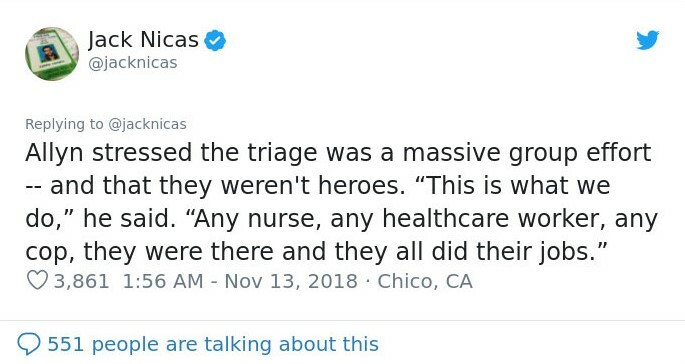 The nurse from Chico, California showed incredible bravery and helped save many people from the blazing flames, risking his own life! We believe that it takes a lot of courage and a big heart in order for someone to do what he did! 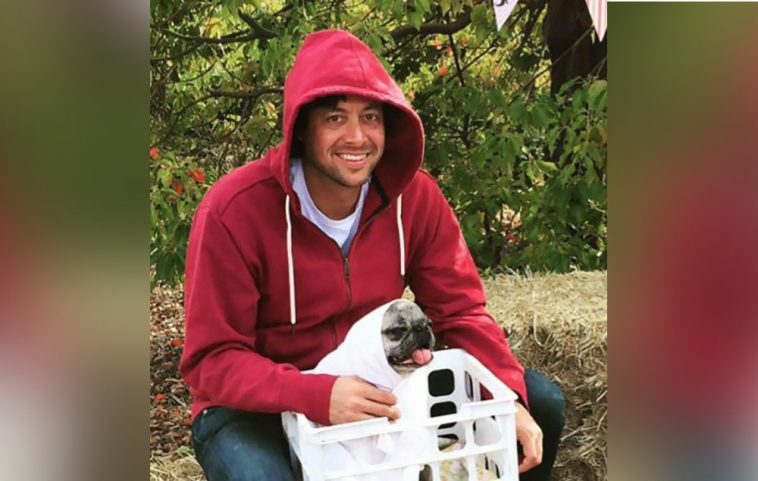 This is another proof that not all heroes wear capes! Sometimes they drive a Toyota pickup truck! Check out the images below which follow his story, the reactions and the amazing response from Toyota. We know that trucks are built to endure heavy terrain and loads but this is something completely different! This truck is like an armored tank! As you can see, the white Tundra suffered some damage but driving though the flames was like a walk in the park for the impressive machine! Allyn nicknamed his vehicle ‘The Pandra’ and we like how that sounds. 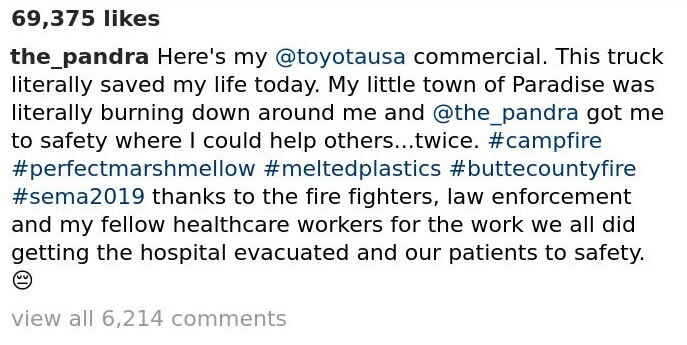 When he showed the damage on his truck in his social media account, he even joked about it and tagged Toyota USA saying that his post is a really impressive commercial. We could not agree more with that. Seeing a nice TV ad is one thing but testing the truck in unbelievable conditions and seeing it doing an amazing job is a completely another story! We love it when huge corporations are humble enough to see things through a different perspective instead of responding in the typical business fashion. The employee who manages the account on social media wrote the best possible thing! The company showed their support and admiration and stated that they will supply Allyn with a brand new truck! How cool is that! In his next post, Nicas posted a photo which he got from Allyn himself! The photo looks like the scene of an action movie but it was completely real, of course. The three people in the truck soon found themselves trapped, because there was no way ahead. The cars around them caught fire one by one and they realized they needed to figure out how to get away from that spot. We guess that thing got pretty intense and Allyn decided to do something about it. 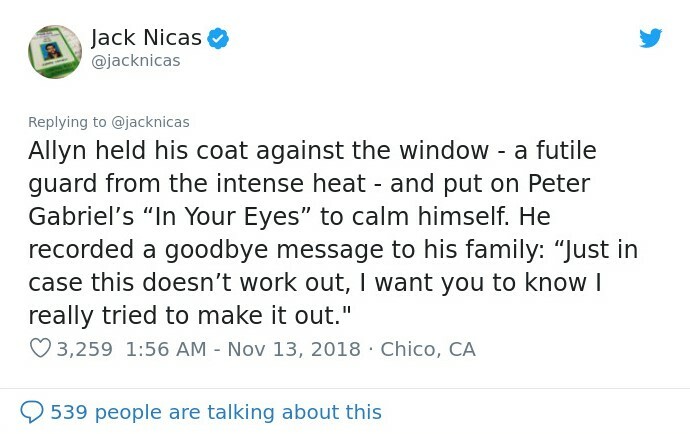 He used his coat as a shield which he put on the window. The brave man even tried to set a mood by playing Peter Gabriel’s ‘In Your Eyes’. Maybe this is when he decided to record a goodbye message for his family. In the recording Allyn says that he wanted his family to know that he really tried his best. He was right to think that the whole stunt was a deadly threat. 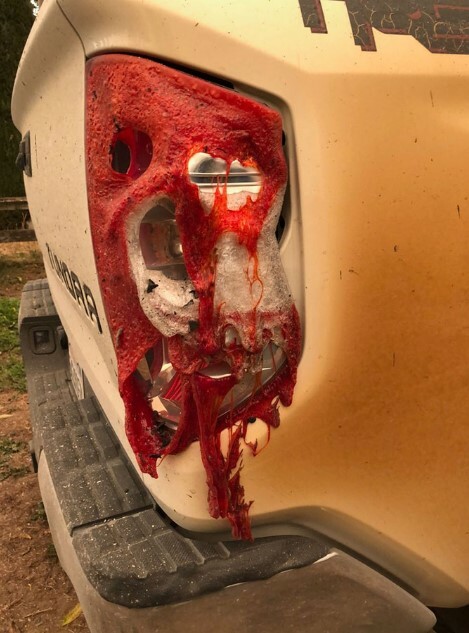 As tough as the truck turned out to be, it had not chance against the raging fire and suffered some damaged, the side mirror, the taillight, the headlight and the bumper melted right off. Incredibly, the melted lights still worked after the whole thing was over! Talking about build quality, right? The New York Times reporter continued with his social media posts and added some more photos of the damage on the Tundra. Just when things began to feel really bad, something amazing happened! A bulldozer drove nearby and pushed a burning truck that was right next to Allyn’s Tundra. He realized that he has enough room to maneuver and so he did. Everyone would probably continue their way ahead, but not Allyn. 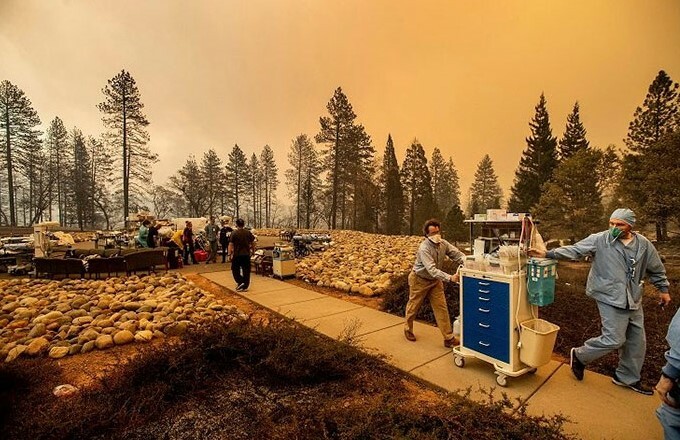 He turned the truck around and returned to the hospital with the intention to help as much people as possible. 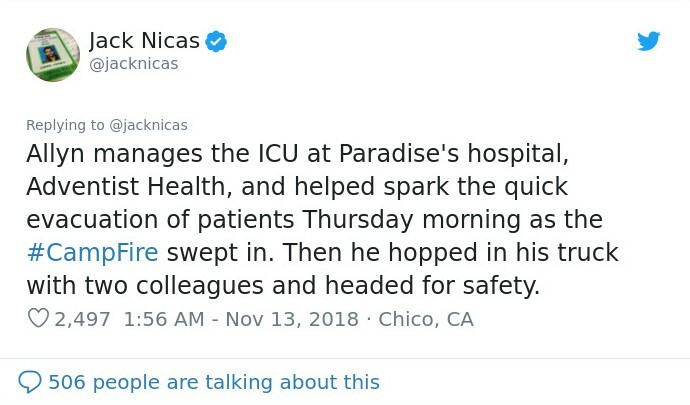 Nicas shared another post describing the moment when Allyn arrived back at the hospital. He saw that a lot of the town’s residents were at the hospital in need of a medical assistance. This is when he realized that times like these require certain actions and the medics are good at keeping people safe and taking care of their injuries. After Allyn and his colleagues realized that they needed to provide assistance, they simply did what they had to do. They literally broke into the hospital building and got everything they needed to set up a triage in the middle of the parking lot. They dragged out oxygen tanks and all kind of other things and provided medical care for over twenty people! The fire was raging all around them but these people were so dedicated to their work that they did in the face an immediate danger! We salute this kind of bravery because it is something truly special! 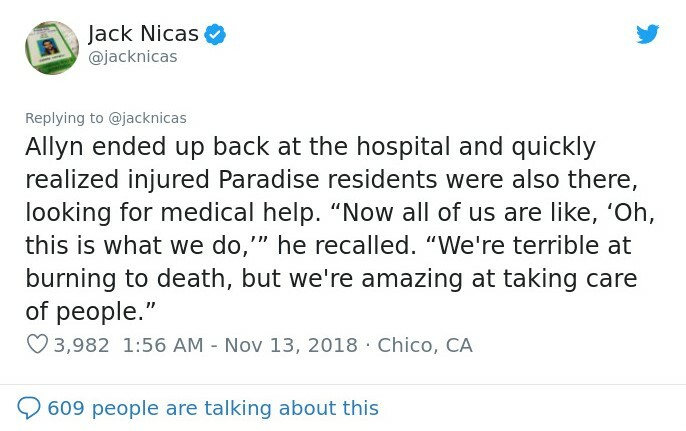 Nicas continued with the story and pointed out that soon after the medics began treating the injured patients, the hospital caught fire so everyone had to be relocated. The team made sure to move everyone about a hundred yards away, but it was a temporary thing to do. Fortunately for everyone, the authorities eventually cleared a path and all the injured people got in a caravan and drove off to safety. The good news is that everyone made it! Later Allyn told the reporter that what happened at the hospital parking lot was the result of everyone’s effort. He stated that there was no heroism involved and that was merely everyone’s line of duty. Imagine how humble this person must be in order to say things like that! We respect everyone’s actions but we also like this kind of attitude! 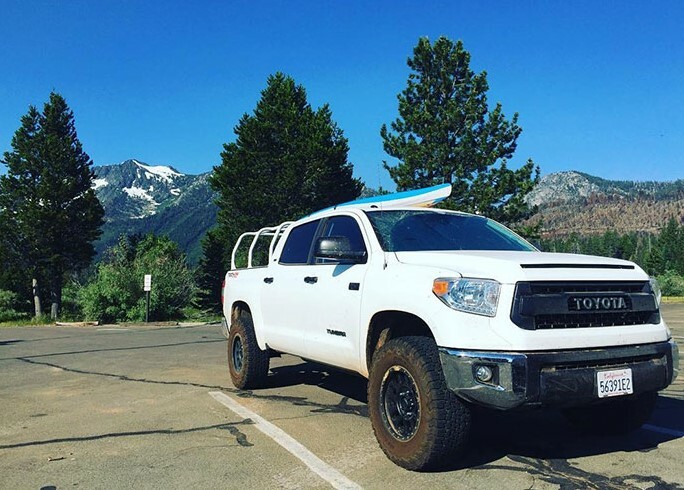 Here is Allyn’s white Tundra, pictured before it became a hero. As you can see, it is all white with some black accents, which is probably the reason why Allyn nicknamed it ‘The Pandra’. 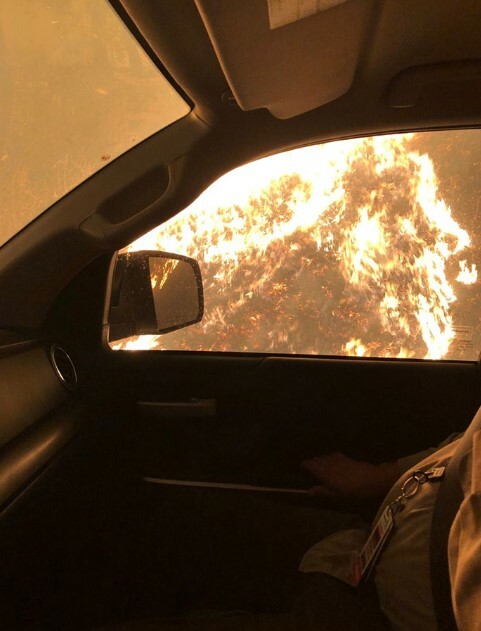 The truck was in mint condition but that fact certainly did not stop the brave man from driving straight into the inferno! 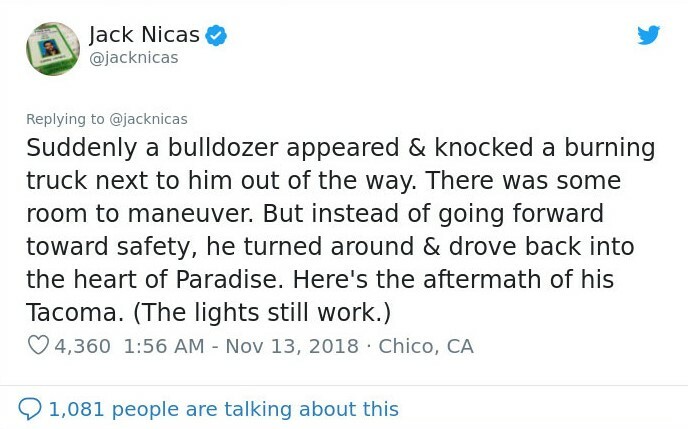 He was probably glad that he did not buy a Prius for all the obvious reasons. It looks like the accidental hero is leading an active lifestyle. There is a kayak on the roof of the Tundra. His adventurous nature probably helped him make all the right decisions during the disaster. People reacted immediately and showed their support for Allyn and the town community. 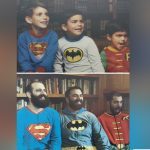 The ‘hero’ hashtag appeared in some of the post and we think it has every right to be mentioned! 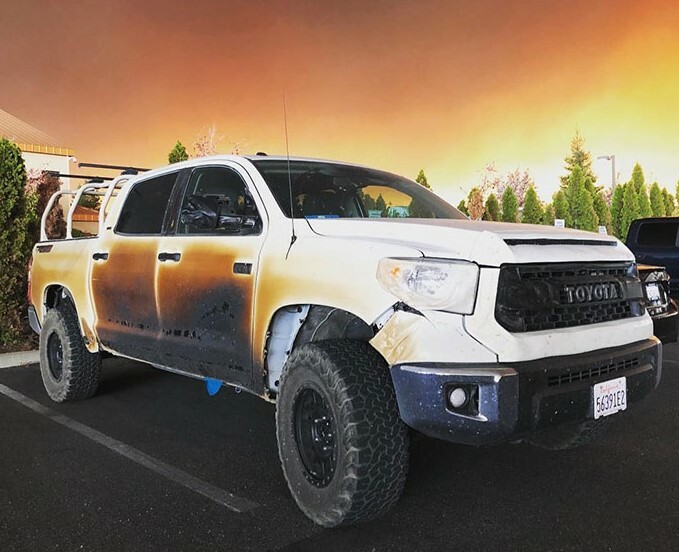 Regardless of how humble Allyn described everything that happened, he and his truck are among the heroes who helped save many lives in a time of devastation and fear. As we already mentioned, there are not many people who would gladly drove straight into the raging fire with the intention to save people. Above everything else he did, Allyn set an example that will surely be remembered! We believe that Toyota USA had the perfect response to this story and this was the least they could do under these circumstances. It was probably a normal thing that a lot of people noted that Toyota USA pulled off a brilliant marketing campaign without spending a cent! In fact, they were not aware of the action until Allyn posted on social media. The cost of the new truck they promised to give him is nothing compared to the cost of an actual marketing campaign. However, we think that Toyota USA really appreciated the human side of things and they really meant what they stated, despite the marketing effect of this story.